Hitachi Asia Ltd. won a S$78 million (J¥5.4 billion) contract from Sentosa Development Corporation (SDC) to build a new monorail system, "Sentosa Express." The 2.1 km long double track line links the main island of Singapore and Sentosa Island, with gateway stations at World Trade Centre's Harbour Front MRT Station and Central Beach on Sentosa. The line improves access to Sentosa Island from the southernmost tip of Singapore. The monorail route has four stations. The Sentosa Express is the first in the world to use Hitachi's new small monorail system. The system was originally developed by Hitachi in Japan as a small, standard and cost-effective solution to the transportation needs of small to medium-sized cities. 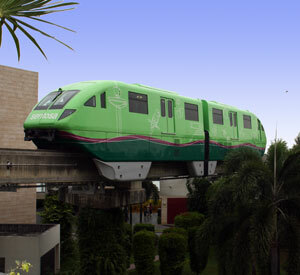 The monorail replaces the small Von Roll monorail that circled the island from 1981 to March of 2005.